Riedel Communications recently presented its new RockNet solutions for SSL and Soundcraft Si consoles at the IBC 2012 show in Amsterdam. In close collaboration, Solid State Logic and Riedel Communications developed the next generation RockNet firmware for the RockNet RN.334.MD MADI interface that allows interfacing between RockNet Digital Audio Networks and SSL mixing consoles. 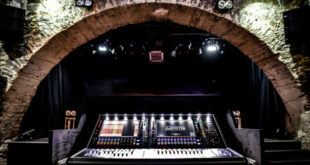 This renders the SSL console an integrated part of the RockNet system, including remote control of all gains and the flexibility of RockNet’s Independent Gain feature. Independent Gain is designed to allow several mixing consoles to operate with the same mic pre-amps without affecting each other. While the master-console controls the analogue gain of the pre-amps remotely, all other consoles operate with emulated pre-amps as if they were also controlling the actual mic input. The new RN.344.SI card provides RockNet integration for any Soundcraft Si compact console via the console’s expansion slot. In its first firmware release, the card supports 32 inputs and 32 outputs to the RockNet system. A wordclock output is available at the front panel, while a rotary switch is provided for device identification and selection of up to 16 programmable routing tables. The RN.344.SI enables the respective Soundcraft product to become a part of the RockNet digital audio network and facilitates remote control of any RockNet microphone pre-amplifier. The RN.344.SI also supports RockNet’s Independent Gain Feature. The portfolio of RockNet interfaces for console integration includes dedicated solutions for Yamaha, Studer, Soundcraft and SSL consoles, as well as a MADI unit for integrating consoles from additional brands. RockNet also allows consoles from various manufacturers to operate simultaneously within the same audio network.